The Queen City Yacht Club's board of directors wanted to be sure the electrical system on site did not provided a fire risk. The board of directors called Boldstar. The electrical system was given a complete infrared inspection. The "electrical fires" that were waiting to happen were sniffed out by the infrared scan. The report that was delivered to the board allowed them to spend repair dollars with piece of mind. 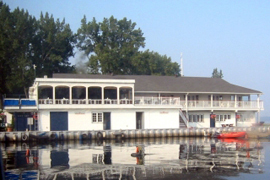 Various electrical problems were noted during the Yacht Club site electrical system scan. The Boldstar report detailed the locations, severity and suggested corrective actions require to eliminate the "hot-spots". Here a 15 amp ciruit breaker's wire connection was measured at over 70 degees C with current overload conditions. .